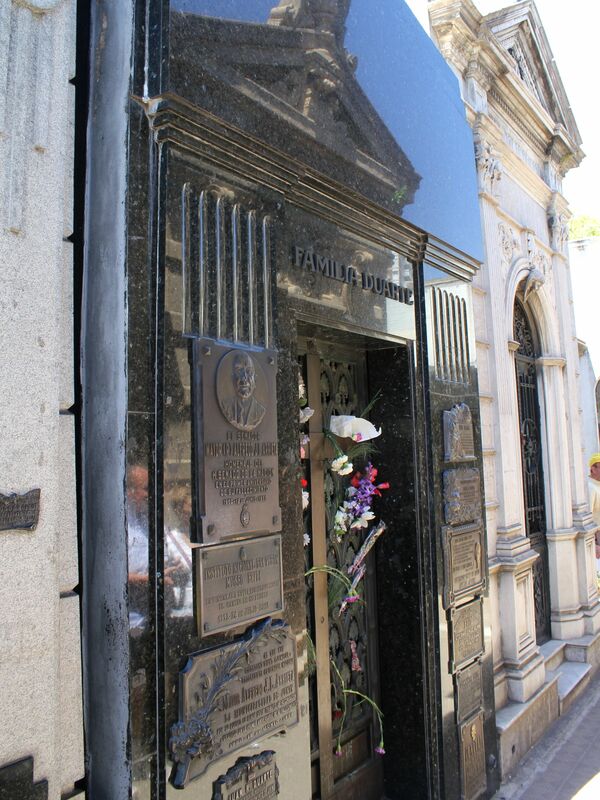 The story behind Evita’s burial is as tragic and full of confusion as her short life which ended in 1952. 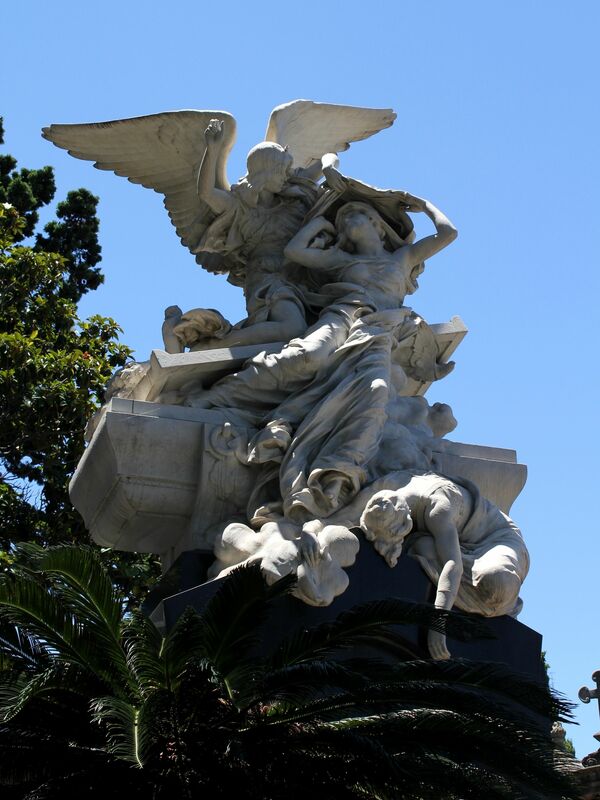 To glorify her as a “Queen of People” and praise her charitable work there was a plan to bury her under an enormous statue ‘Descamisados’ (“Shirtless”) – a clear reference to her dedication and love for orphans and in general – those unprivileged. However shortly after her death the political landscape in Argentina abruptly changed. 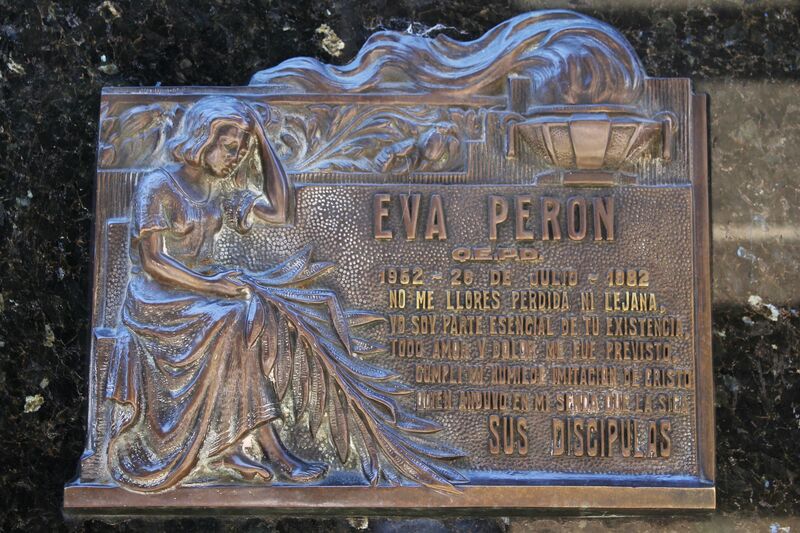 Juan Peron was forced to leave the country and Evita’s burial project took the drastic an unexpected turn. The name “Evita” itself was considered so dangerous for subsequent military governments that her body was secretly taken to Italy and buried in Milan under the false name Maria Maggi. For long 16 years she completely disappeared from the “surface”. By some she was seen in the darkest depths of the Hades, for many in the center of blooming meadows of the Elysian Fields (In Greek’s mythology a place reserved for heroic and virtuous). 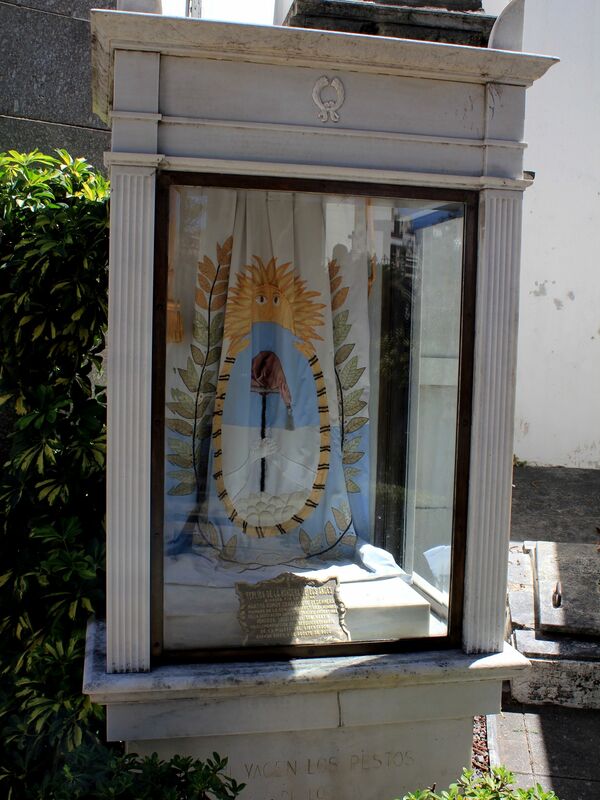 It took another act of grotesque - “kidnapping” the cadaver of General Pedro Aramburu (president of junta that ruled Argentina and a political enemy of Peron) from his grave in Recoleta to get in exchange from military rulers the mortal remains of Evita. 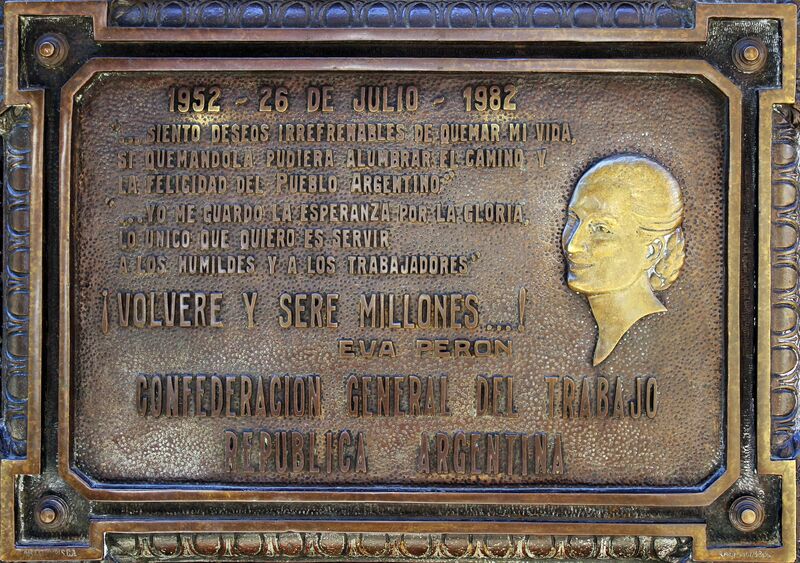 This act of desperation finally brought Evita to Recoleta. 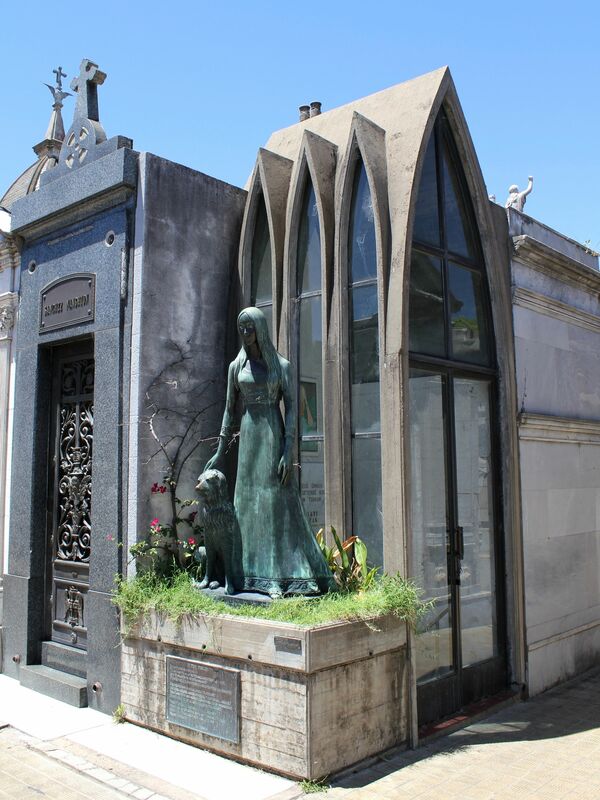 She was buried here in a hastily arranged night ceremony in a “steel-reinforced” and trapdoor protected crypt belonging to the family of Duarte. 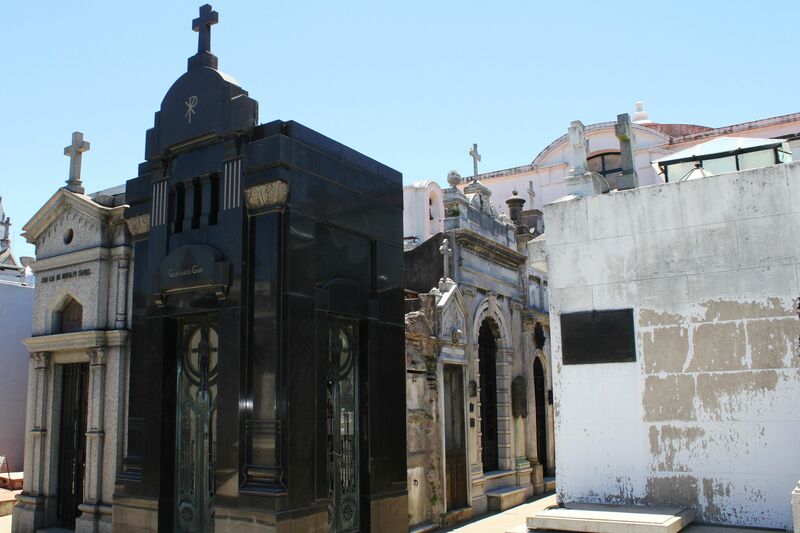 Compared to other mausoleums, this one with black marble façade is simple and unpretentious, Only engraved roses on its front wall and fresh ones in front of it make the tomb standing out. 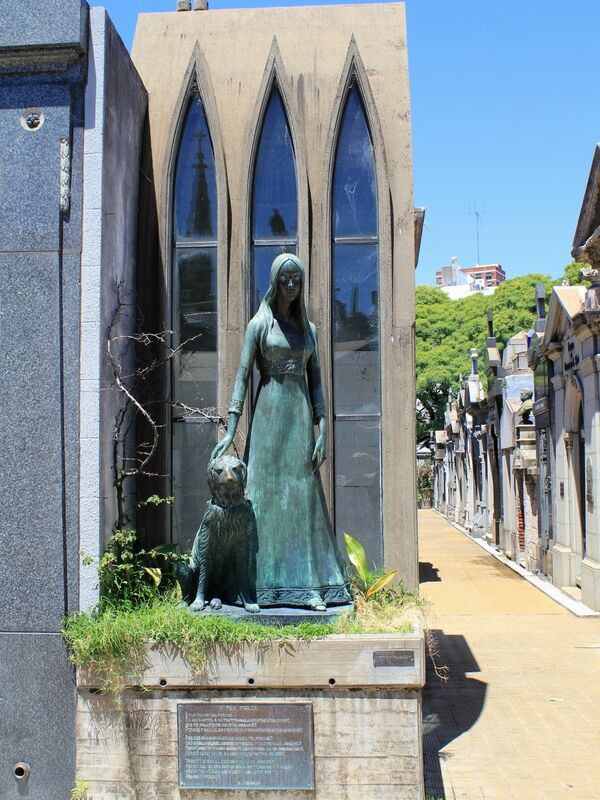 Needless to say that even now after so many years since she left this world, she is still despised by most of Buenos Aires’ upper-class society…. It seems that ”remoteness” of her long fight with the terminal decease did not make substantial changes in a “collective consciousness” of wealthy circles. 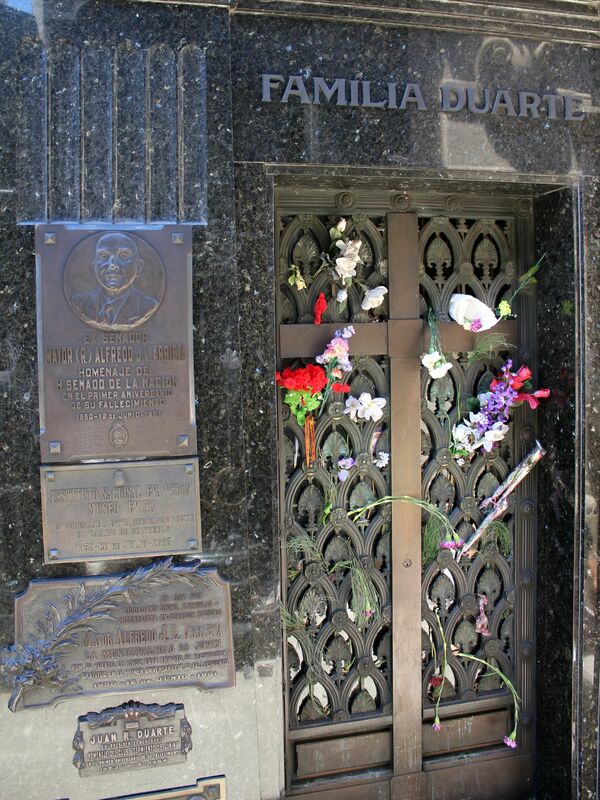 Some say, that the extra protection of the Evita’s crypt is out of fear that one day she may try to re-appear back in this world, if not as a reincarnation then as a myth, a legend able to move the masses of poor, deprived, disinherited…. 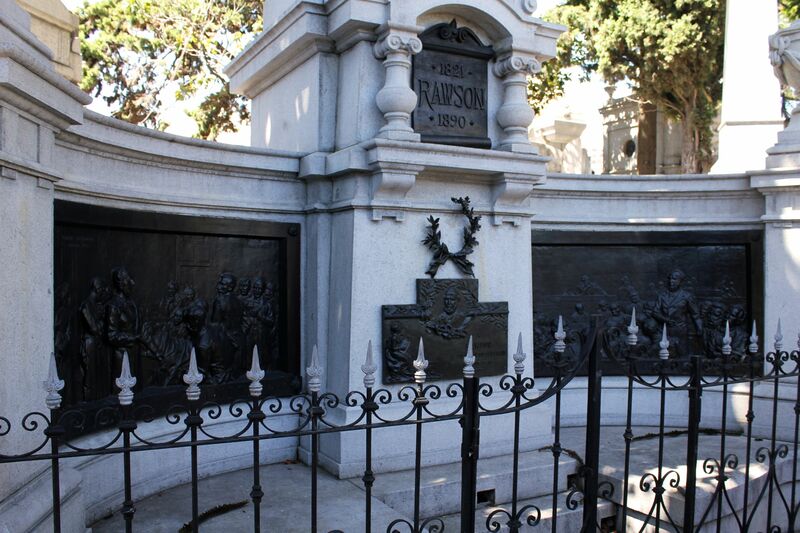 In a huge contrast to most commemorative inscriptions seen all over the Recoleta cemetery these on her crypt are only from workers unions, taxi drivers…. 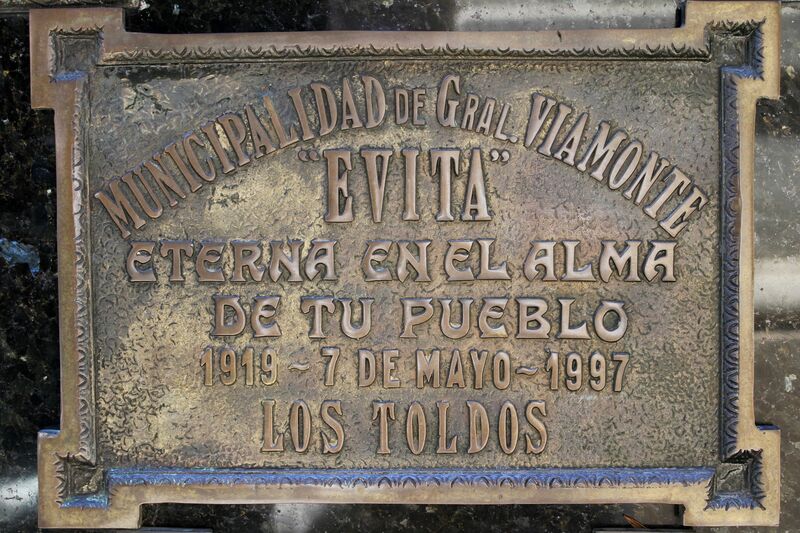 Commemorative plaques on the facade of Evita's Tomb. I will keep the hope for glory. It is true that for millions Evita symbolizes a hope for a better world. Certainly she opened the doors for social justice in Argentina, for recognition of women in this traditionally patriarchal society. 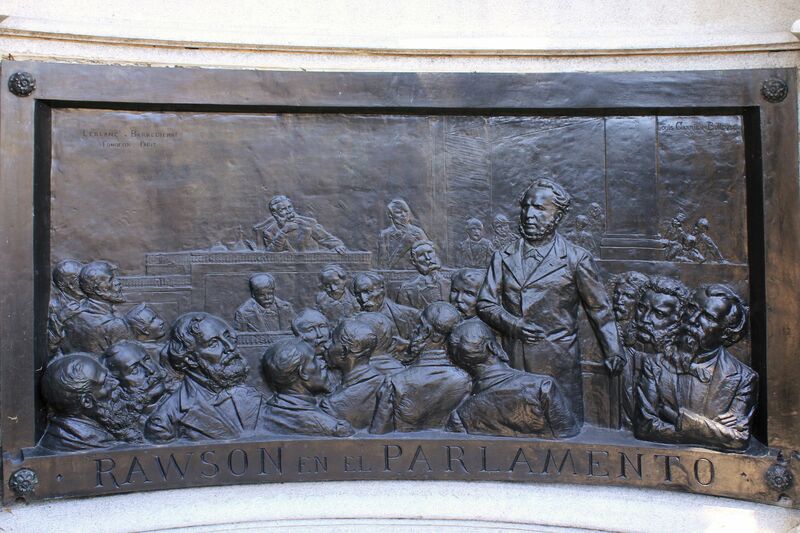 Partially by her apparently strong influence on legislative works introduced by President Peron, but also by her relentless charitable work…. There are more tragic stories. One of them is that of a 26-years old girl Liliana Crociati de Szaszak. Her honeymoon trip to the Austrian Alps in 1970 turned out to be the beginning of the end of her life. The avalanche leveling the hotel mercilessly took so early her innocent life…. Tomb of Liliana Crociati de Szaszak. 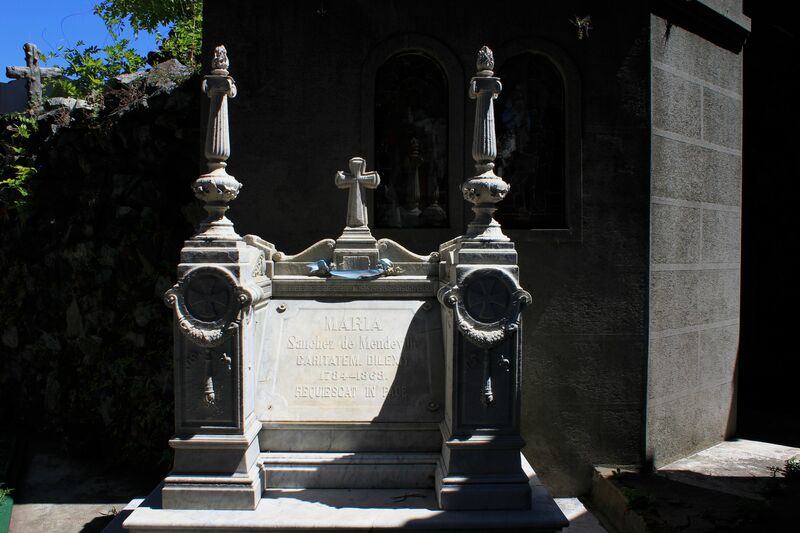 The beautiful neo-gothic style tomb was designed by her mother. 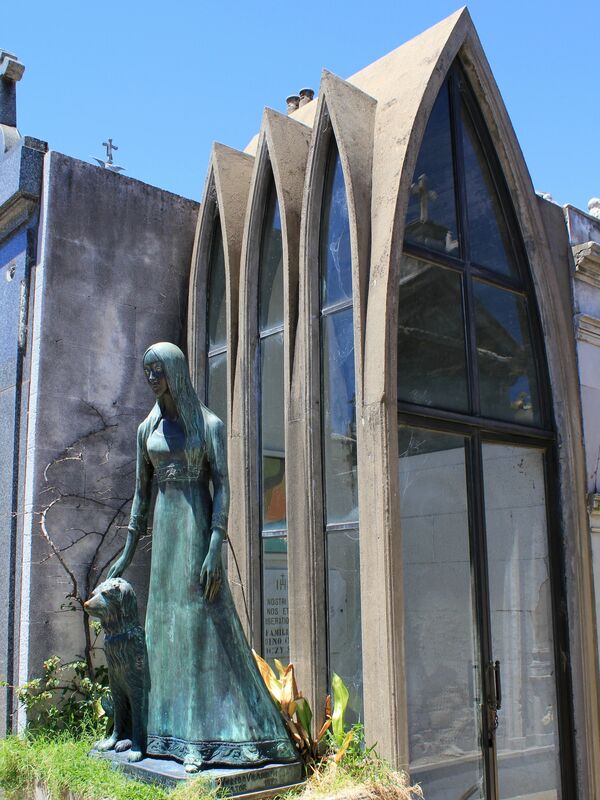 Her life-size statue in the wedding dress with her bellowed dog Sabu on the side (both the work of Wifredo Viladrich) is not easy to miss. 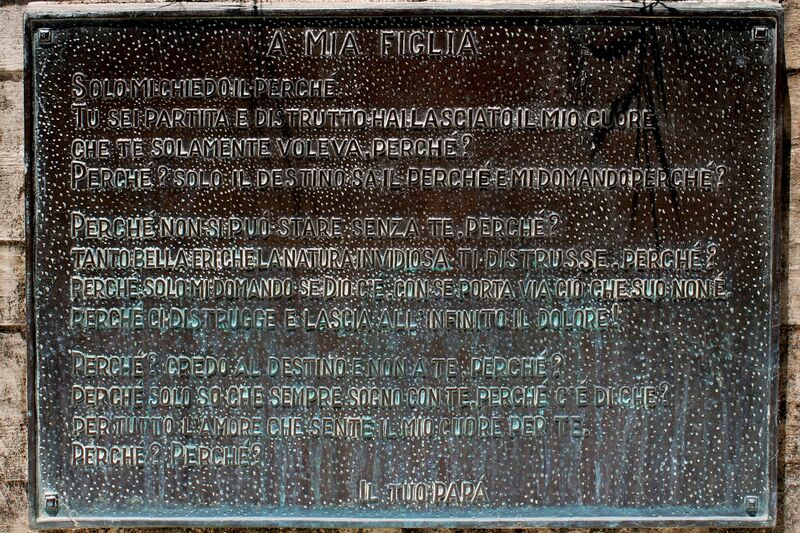 You can still feel an enormous pain of her heartbroken parents by reading words of her father’s poem on the attached plaque (original in Italian). That wanted only you, why? Why? Only destiny knows the reason, and I ask myself why? Because we can’t be without you, why? You were so beautiful that invidious nature destroyed you. Why? I only ask myself why, if God exists, does he take away that which is His name. Because He destroys us and leaves us to an eternity of sadness! Why? I believe in fate and not in you. Why? Because I only know that I always dream with you, why is that? For all the love my heart feels for you. Most of guides still remember an old, grey-haired, stoop-shouldered man – Liliana’s father. For years he was coming here silently spending hours and hours in front of the tomb of his daughter. 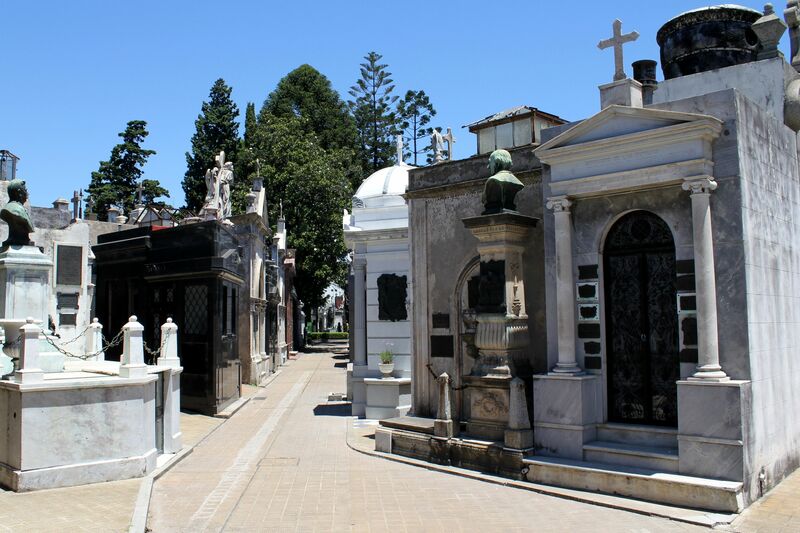 Like most places bringing together so wide spectrum of public figures and celebrities the Recoleta Cemetery is a source of many tales of love, power, wealth and death. Inevitably its background makes it a “fertile ground” for intriguing, tragic, deeply touching and sometimes horrifying stories. 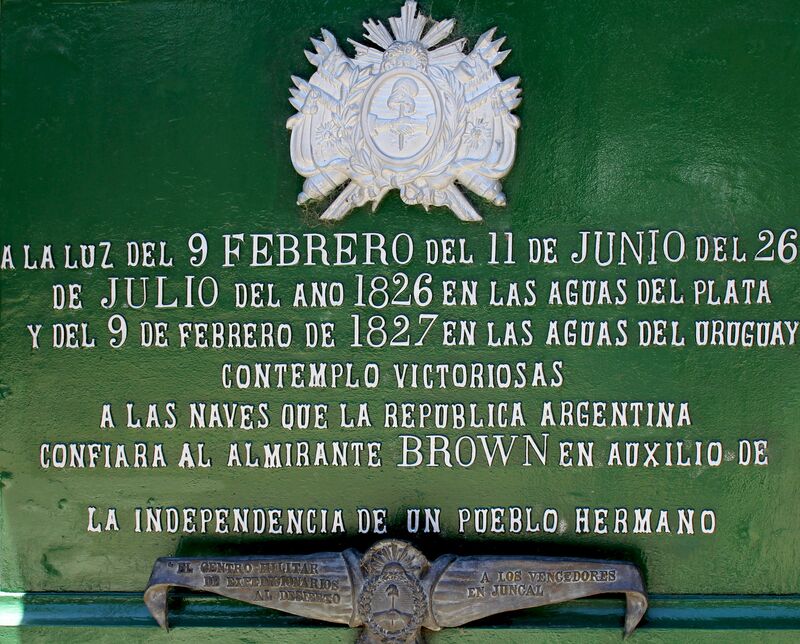 Another tomb and yet another story – this time that of the Admiral Guillermo Brown (rightfully called the “father” of the Argentinean navy). 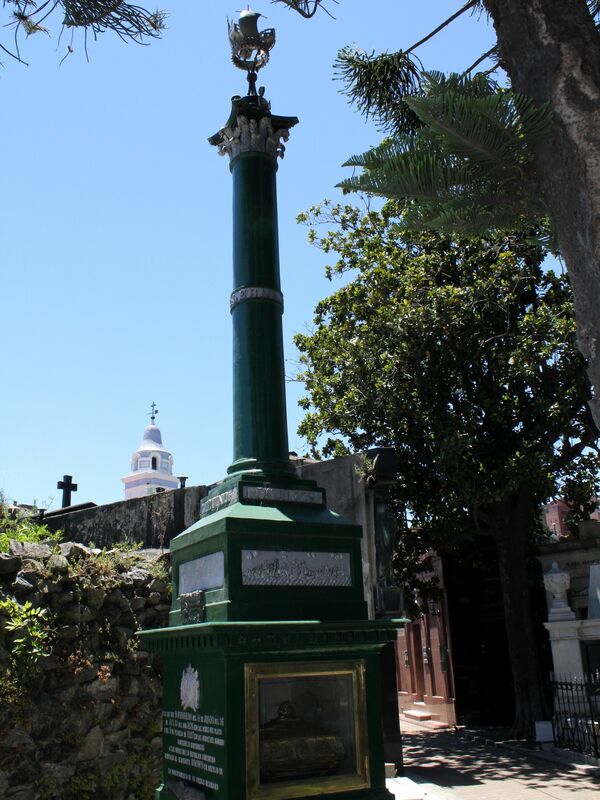 His cremated remains are contained in a bronze urn cast from cannons from captured battleships. But behind his urn there is a smaller one - wooden containing the remains of his daughter Elisa. She took her life at the age of 17 drowning in the Rio de la Plata. Some say, because her father forbade her to marry the “loved one”, others maintain that she took this desperate step after learning of the death of her fiancé’s Major Francis Drummond in a battle under the command of her father. 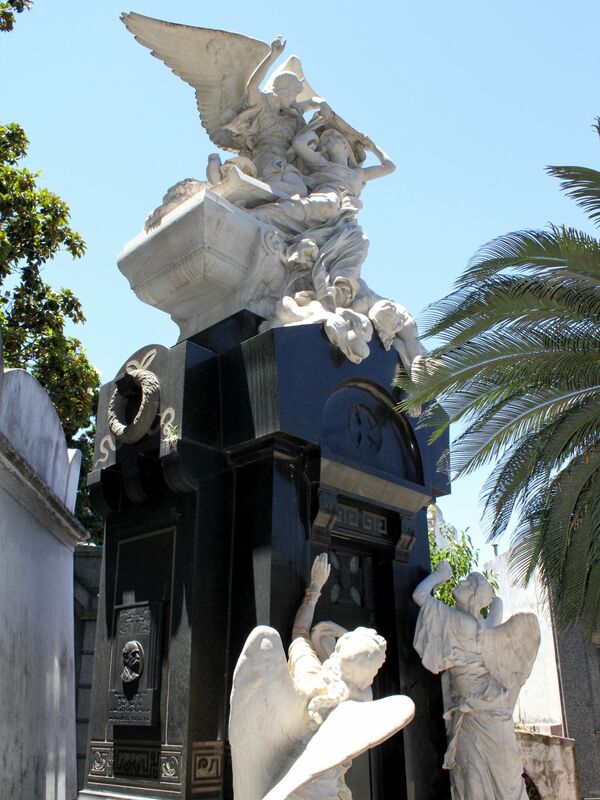 There are many remarkable tombs in Recoleta - among them that of family Paz is considered by many as the most beautiful. 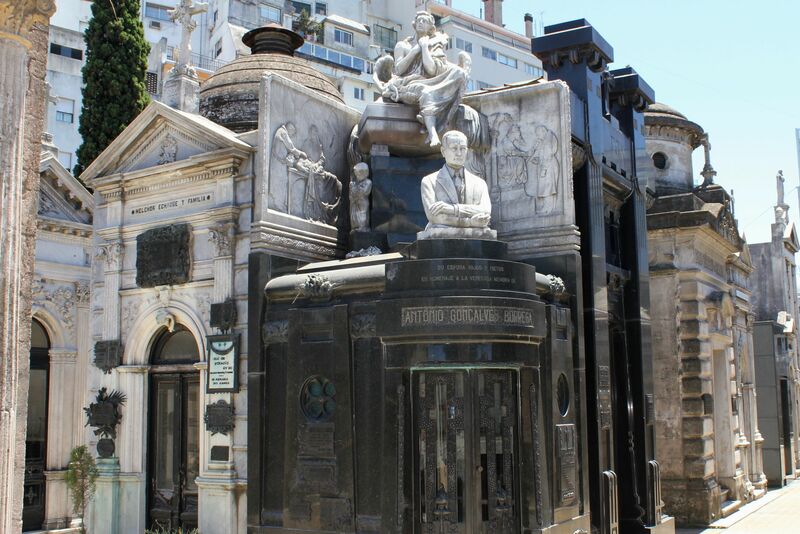 The mausoleum of José C. Paz, (founder of the popular newspaper La Prensa ) is made of black granite. 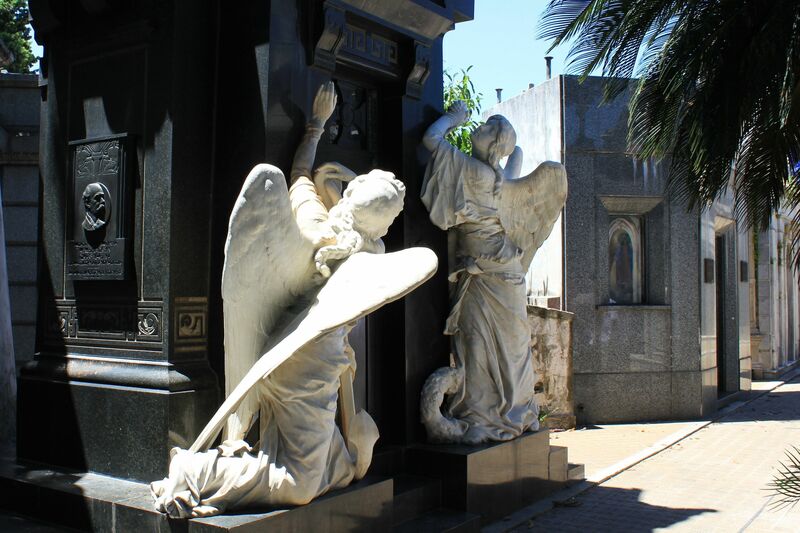 Contrasting with the colors of the main structure is a white marble coffin and life-size angels. One, with the open wings seems to soar to heavens lifting the immortal soul of the “departed” while leaving his earthly body in the coffin. Two Guardian Angels standing at the doors seem to watch invisible spirits rising heavenwards…. 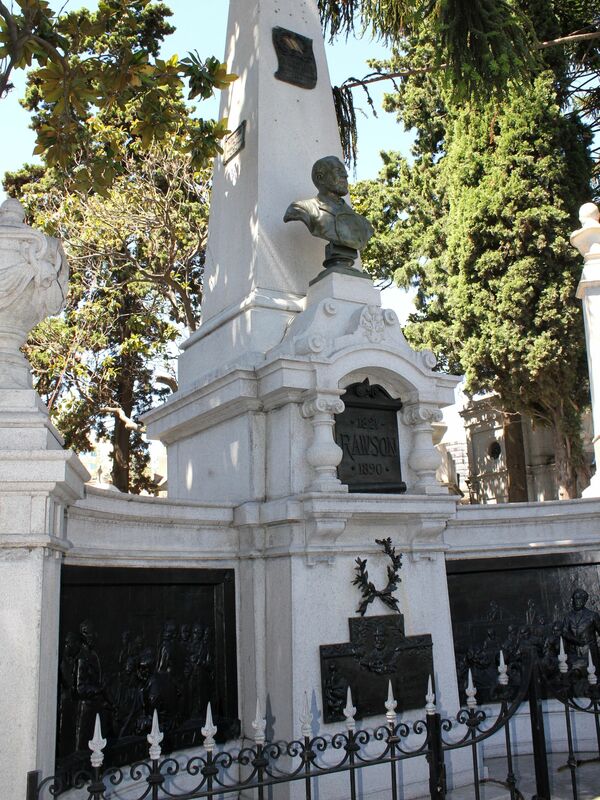 All sculptures were commissioned in France and then shipped to Buenos Aires. 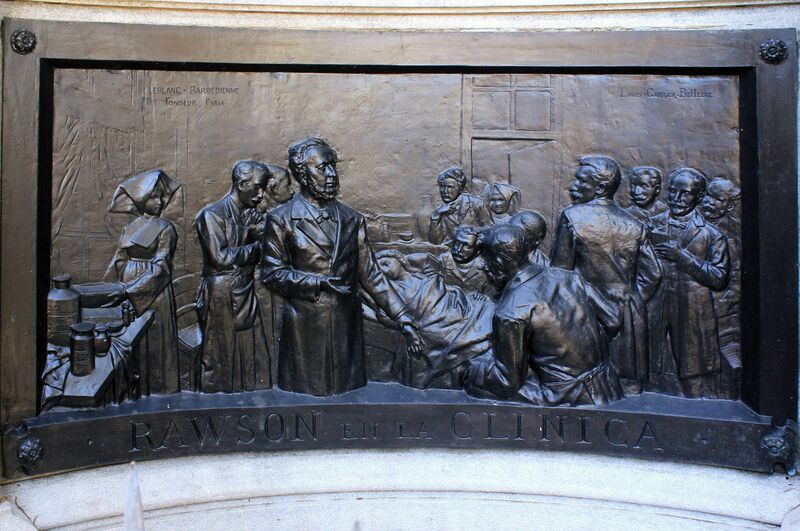 Dr. Guillermo Rawson, son of an American immigrant was a respected medical doctor, scientist and politician. His life is an extraordinary example of honesty and dedication to the public service. 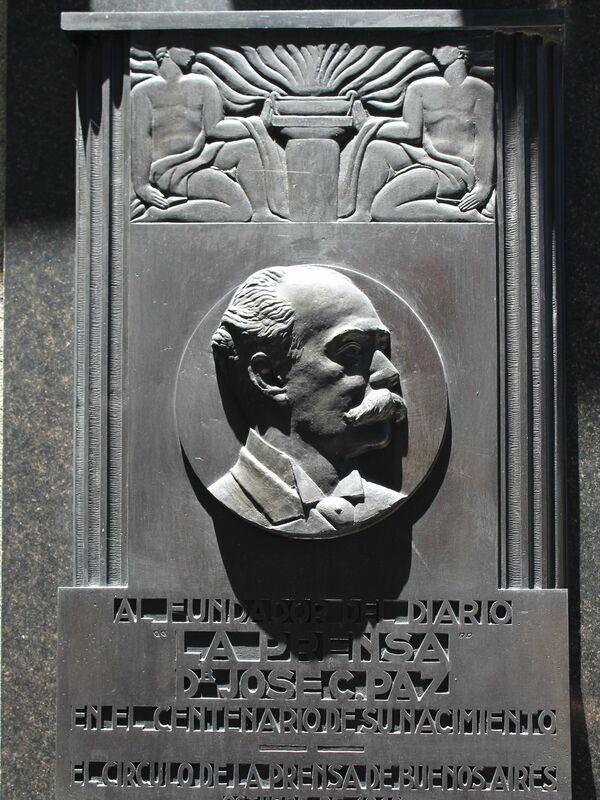 He is remembered for his medical work and political actions to improve the public health by eradicating poverty (unfortunately this seems to be a Sisyphus’ effort), by his exemplary actions during the yellow fever epidemic that struck Buenos Aires in early 1870’s. He played a crucial role in settling Welsh immigrants in the Patagonia (in recognition the capital of Chubut bears his name). He is a co-founder of the Argentinean Red Cross. Despite all of his medical and public work achievements, he was never fully appreciated by successive Argentinean governments (exception was President Mitre). He died in poverty in Paris in 1890. At his funeral President Mitre praised Dr. Rawson by saying: ….”I never found in life one so beautifully gifted closest to the ideal of moral perfection...."
She is mostly known by her name from the first marriage - Mariquita Sanchez de Thompson. She became a symbol of Argentinean women for her political activism (not always “in-line” with governments), for her patriotism, for her charitable work and intellectual brilliance. Her house on Calle Umquera (now Calle Florida) in Buenos Aires was a shining center for gatherings of patriots, political activists, intellectuals, men of culture and art… It was here, on her salons when on May 14, 1813 the Argentinean anthem was sung for the first time in the history of the country…..
She greatly helped to establish the Benevolent Society (la Sociedad Benéfica founded by President Rivadavia) and was her president. In her “older” years she presided over another charitable organization – The Relief Society. She was considered as a woman of “character” – falling in love with her cousin Martin Thompson whom she married despite the strong opposition of the family.